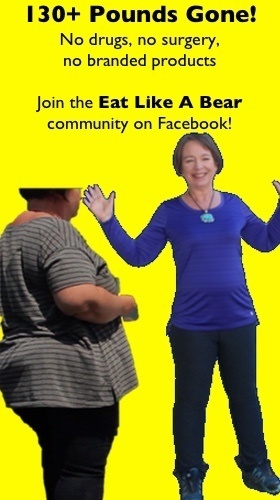 When you have a major harvest, do you try recipes you would never have considered before the bonanza arrived? I sure do! Take this plum brandy, for instance. It took a quantity of ripe plums. Any other year I was too stingy with the fruit to do a “frivolous” project such as this. After tasting it, I’m not considering it so frivolous. What you end up with is a lovely plum liqueur-type drink. I’m enjoying giving it as gifts. There is no counterpart you can find on the market. What a special treat! According to Saveur, who published this recipe, the drink is common in Hungary and Transylvania. After this season it may become common in Central California…at least if I give enough of it away! 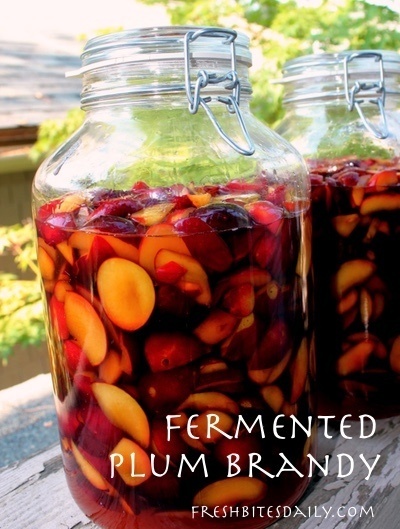 The process for making the drink is simple and straight-forward, a bit time-consuming in cutting up the plums but the promise of a fermented plum liqueur makes it well worth the effort. Wash and stem the plums. Cut the plums into slices or roughly chop them, whichever is easier. The important thing is to expose the flesh. Mix the plum pieces with the sugar, coating each plum slice well with sugar. The sugar will pull juice from the fruit and begin the fermenting process. Place the sugared plum mixture into a wide-mouthed glass jar, filling it to within a couple of inches of the top. If you have a special jar with a lid for fermenting projects, use it. If not, partially fill a quart-sized freezer bag with water. Press the bag into the top of the jar to push the fruit below the juice. If juice has not worked its way to the top of the jar, press and push on the fruit until enough juice has formed to cover the plum pieces. 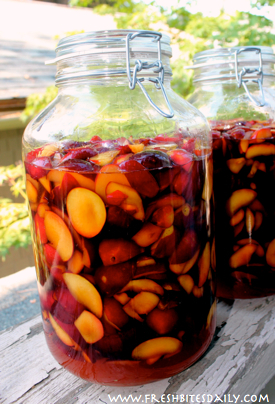 Keep the fermenting fruit at room temperature for two weeks. In a really active ferment, the juice may spill over the top of the jar. To keep things tidy set the jar on a rimmed dinner plate. If you have a problem with ants, pour water onto the plate to form a “mote”. Ants in this neck of the woods don’t like to swim. The ferment stays safe. At the end of two weeks, strain out the juice and mix it with equal amounts of brandy. Keep this drink refrigerated. It holds nicely for at least a month and will probably be fine for weeks longer. With the first batch I made, the worn out plum slices had little flavor. They went to the chickens who disagreed with me. The second batch was made with riper plums and the leftover plum pieces were so delicious I froze them in 2-cup containers to use in place of grated zucchini in sweet breads. I froze them as quickly as I could to keep from eating them all. Oh my! Make your own decisions on this issue.